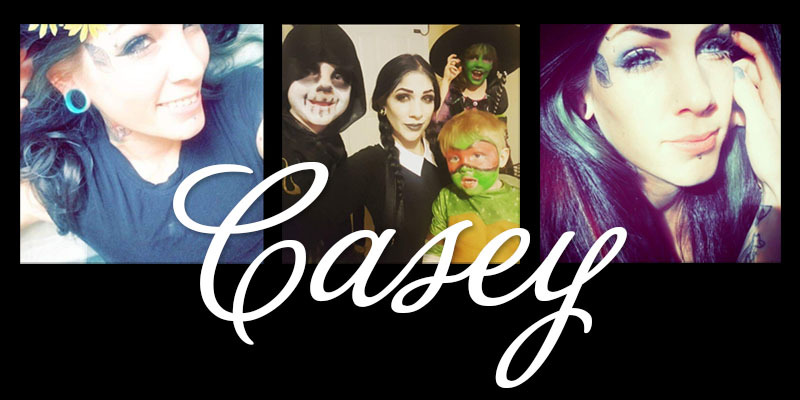 Featured Tattooed Mom: Casey G.
I am so excited to be sharing our very first Featured Tattoo Mom interview! Casey is someone that I have had the pleasure of meeting in person when she moved across the country to start her tattoo apprenticeship. Now that she’s gone we keep in touch on Facebook and I’m so glad to have her as the VERY FIRST Featured Tattooed Mom on the Tattooed Moms Club blog!! I have 3 kids. They’re 9, 6, and 4. A girl and 2 boys. They are Marley, Lyall, and Liam. They are extremely outspoken and adventurous. Never a dull moment. I’m the colorful mom. Between the way that I dress and extensive hair choices lol I’m a spectacle. Patience. Remembering that this tiny human is doing all these things for the first time. Every thing that seems so minuscule and simple is brand new and sketchy for them. I think we forget this is all new. It’s a lot more fun when you remember that part. Every experience is a new adventure. I get wonderful looks and stares at any school function. I can tell the staff assume my children won’t be well behaved or intelligent. My face is tattooed and I plan on covering the rest of my neck so I’m sure it’ll get even better. What I have to me feels like not enough. However I’ve been turned away from multiple jobs due to them saying my look is too extreme. Or I’ve had to cover tattoos with make up and band aids. It’s so hard to pick a favorite. I’ve had amazing artists from all over put their work on me. Most recently I’ve been working with Edd Word. He’s the owner of Bad Apple Tattoo in Las Vegas and he’s absolutely amazing. He did a beautiful seashell on my face, as well as the Seal of Bethmoora on my stomach and my current favorite, Love Killed Me piece on my neck. The raven kills it; I adore his work. I have awesome new school calf pieces by my favorite brothers, Scott and Kevin Cutlip. On my forearm I have a neo traditional piece by Corey Wesley Mackenzie as well. The start of my work and first few pieces were done by the amazing John Artist. The person who originally brought me into the world of tattooing. He did my first three tattoos in a 3 day span back in 2006. I was 16. It was just before Christmas. Literally like the day before Christmas Eve. I got a devil cherub on my shoulder. I love to crochet, and I read a lot. I just started gardening and I plan on refurbishing a chicken coop. GlasSea. It would be like deep blue with an interesting twist of green to it. Like the glass that gets softened by the sea. Thanks so much for sharing a bit of your story with us, Casey!! We’re happy to have you as part of the Moms Club!! All featured moms are part of the “Moms Club” and you can find all of their posts in the Moms Club category. Get to know the moms in the club – they’re all amazing! Next post What if my kids want to get tattoos when they’re 10?